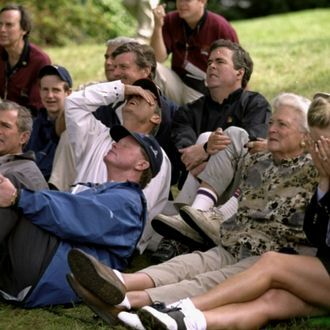 The Bush family watches Jeb's campaign, probably. 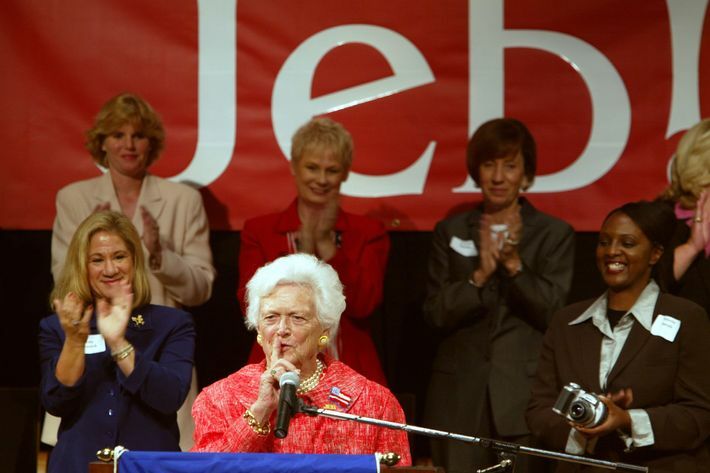 It has not been a good month for Jeb Bush. With his poll numbers falling to the single digits, his campaign making spending cuts to prepare for the long winter, his fund-raising becoming unimpressive, and Donald Trump continuing to exist, Bush donors and friends have started peppering his campaign with backhanded compliments and outright insults, hoping the criticism might scare Team Jeb! into functioning like a winner. And as things look worse, these comments become more morbid and more laden with winding metaphors. Jeb’s just blended into the second tier of the Republican pack. When you run for president, you have to be very charismatic, you have to articulate extremely well and you have to show unbelievable amounts of passion. He needs a huge performance. And I’m not sure he’s got one in him. If Bush doesn’t see numbers go up in two weeks, no one is jumping off a bridge. Jeb is not spectacular. But he’s solid and steady. I don’t think Jeb’s getting out of the race, but it’s certainly sinking in that he can’t revive himself just from the ads. He can’t buy his way back. The [poll] numbers are beginning to get hard. The candidate has to have a moment out there, and if that doesn’t happen, I just don’t know. It’s as if we keep investing in a company and, as a shareholder, we’re not seeing any sales. If this election is about how we’re going to fight to get nothing done, then I don’t want to have any part of it. I don’t want to be elected president to just sit around and see gridlock become so dominant that people are literally in decline in their lives. That is not my motivation. I got a lot of really cool things I could do other than sit around and be miserable, listening to people demonize me and feeling compelled to demonize me. It feels very much like a death spiral, and it breaks my heart. I don’t know anyone who wants to reinvest now … I wouldn’t be shocked in 60 days from now if he wasn’t in the race. The patient is either in intensive care and in need of some good doctors who can save him or being put into hospice and we’re going to see a slow death.